Presidential hopeful Bernie Sanders spoke to an audience of supporters in Chicago Wednesday. Democratic presidential contender Bernie Sanders told an invite-only group of Latino activists and politicians Wednesday night that he plans to use executive orders as a means of bypassing Congress to guarantee a path to legalization for millions of undocumented immigrants. Sanders spoke to a crowd of supporters at the Village Leadership Academy near the UIC campus, flanked on stage by progressive activists such as Atlanta rapper Killer Mike, academic Cornel West, and Ben and Jerry's cofounder Ben Cohen. But hours before Sanders reached the stage, he met with community members at Little Village's El Pollo Feliz restaurant. 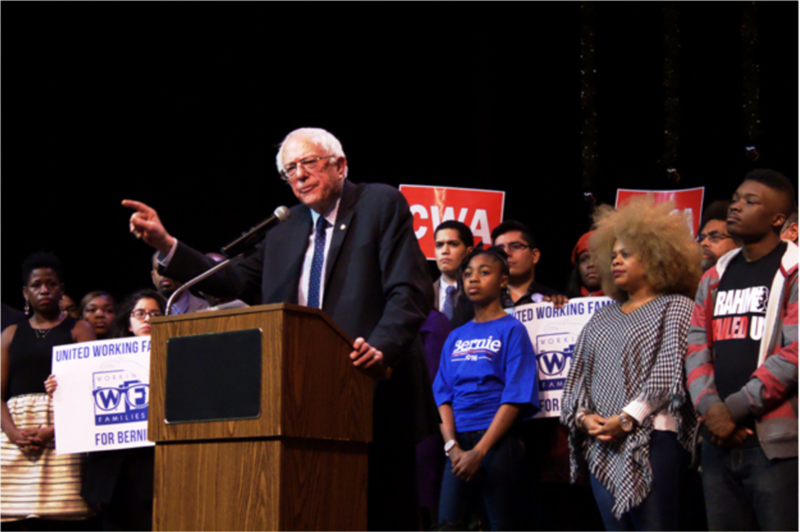 Sanders first spoke against economic injustice and in favor of increasing the minimum wage to $15 an hour. Then a community organizer forced Sanders into a discussion on immigration, according to several people who attended the meeting. Tania Unzueta, an undocumented immigrant and cofounder of Immigrant Youth Justice League, asked Sanders how he planned to bring comprehensive immigration reform if he were elected as president. Sanders then proposed to use executive orders to broaden President Barack Obama's Deferred Action for Childhood Arrivals (DACA) program, and the Deferred Action for Parents of Americans (DAPA). Sanders said he believes this plan to be within the scope of presidential powers. Unzueta did not respond to a request for comment. Currently DACA candidates must have come to the United States before their 16th birthday and before 2007 to be eligible for the program. DAPA candidates must have lived in the United States since 2010 and either have children who are American citizens or children who are lawful permanent residents. Under Sanders's previously proposed immigration plan, all undocumented people living in the United States for at least five years would be allowed to stay in the country without the fear of being deported. "Close to nine million individuals would be able to apply for deferred action," according to Sanders's policy proposal. The plan also promotes increased legal counsel for detained immigrants and pushes for an end to for-profit prisons. Sanders has struggled to win support from the Latino voters his campaign desperately needs to edge out Democratic frontrunner Hillary Clinton. The most recent poll of Latinos, conducted by ImpreMedia/Latino Decisions, shows Clinton heavily favored by Latino voters in battleground states, with 62 percent compared to Sanders's 39 percent. Thirty-fifth Ward alderman Carlos Ramirez-Rosa, who also attended the Little Village meeting, says Latino voters are misguided in choosing Clinton; Sanders is the only Democratic candidate looking out for the best interests of Latino immigrants, he says. "Hillary came out and said she wanted to deport the refugee children that were fleeing violence in Central America," Rosa said. In contrast, "Bernie has said he is going to work to keep families together." The alderman was referring to comments Clinton made back in August when she said it was important to send a message to families in Central America and deter them from allowing their children take such a dangerous journey. "If you look at the stances [Clinton's] husband took, if you look at the stances she's taken in recent history, it's always clear she has not been an ally to immigrant families," Rosa added. The alderman's sister, Jackie Rosa, also attended the meeting. She said what stood out the most for her was Sanders's genuineness. "He did not pander or tokenize to the Latino crowd," she said. "No silly 'Hola amigos' was uttered. Definitely no tone-deaf 'abuela' approach to relating to the crowd." Rosa's "abuela" remark came on the heels of a recent Clinton's blog post titled "7 things Hillary Clinton has in common with your abuela"—the Spanish word for grandma. The blog post was seen as pandering to Latino voters, and led to a backlash and the trending Twitter topic #NotMyAbuela. "[Sanders] delivered with passion the same message and vision that he wants for all Americans," Jackie Rosa said. "I think I have a mandate that Logan Square remains diverse," says the 35th Ward alderman. The Vermont senator is nothing like the Chicagoan he wants to succeed—but does that spell his political doom? Chicago used to be at the vanguard of community policing. But more than two decades after the strategy was launched, CAPS is a shadow of its former self. Attendees at an election night party in the South Loop react to Hillary Clinton's string of victories.